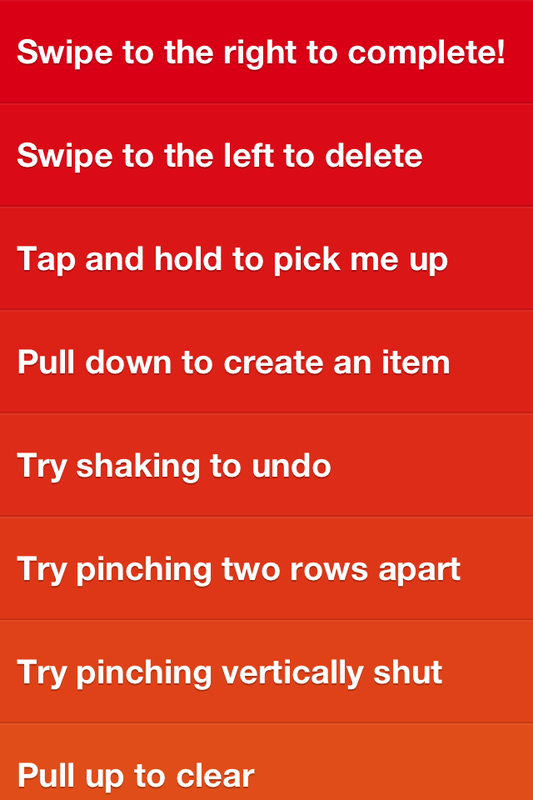 One Tap Less | Translation of Gestures from iOS to OS X. Creating an app is already complicated, Jesus, this blog is yet not responsive. When you develop for Windows, Mac, Linux, you can keep most of the concept when crossing platforms, yet how to move between every instance from Apple? How to create an OS X app from an iOS app and keep the familiarity? When designing the gestures for an OS X app, if you’re willing to use them, you must keep in mind that the user is inclined to use the default gestures, this narrows down your possibilities. If there’s no function for the secondary click, you can use that, but, again, the secondary click is used when a user is looking for further options, so it fits best when the replacement also follows the same functionality. Scrolling is scrolling, seriously, you don’t want to mess with that. Pinching and spreading are, in my opinion, those gestures you never actually remember to use. Smart zoom also joins the pinching/spreading club. And, really, when did you use rotate the last time? Gestures with three fingers or more are universal and you simply can’t use them for your map. I never used any four fingers gestures, if there’s any importance there, I’d rather use a hot corner. This sort of only leaves you with the two-fingers swipe to change between panels. On iOS, you have everything. When the application is open, the entire screen is yours, on OS X you must handle with a whole environment wrapping your application. This is why it is easier to use clicks to handle interactions on OS X, specially as the larger screen state offers a better grid to set the triggers, meanwhile, since your screen size is drastically smaller on iOS, whatever can be hidden and intuitively uncovered is often the best option. This is probably the challenge the folks at Realmac faced when developing Clear for Mac. You probably already know the iOS counterpart and you recognize how awesome of an application it is. If you’re deeper on the app addiction, you may also remember the buzz it caused when it was announced. What I dislike about Clear for Mac is how several gestures rely on your cursor. 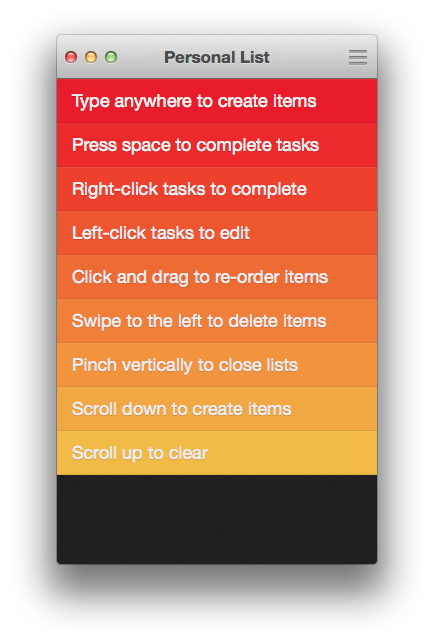 Space or swipe to complete a task is up to where your cursor is. Positioning your cursor is a different kind of action than swiping, specially when it requires an additional finger. Hitting the space bar means moving the attention from the trackpad to the keyboard. Clicking is probably the only frictionless gesture, so clicking and dragging to move your items around your list seems more natural than swiping, but clicking, as simple as it is, on Clear for Mac it goes for editing an item. Meanwhile, there’s no double-click gesture, and that’s one of the most natural gestures on desktop (or, literally, laptop, in my case). And the mean issue about clicking to edit is that while we’re in Edit mode, we can’t do anything else. And then creating new items, I honestly feel lost when I just type them in. Use Clear for iOS as a parameter, first you create an item, then you write within it. I don’t know if that’s an issue with my generation, but I always double check if that little cursor is blinking before I start typing. Even if the item is created under the cursor, if it lays on the right side of Clear and you start typing, your cursor is magically transported to the left side as regular for typing. Then, of course, you can scroll down to add new lists, which is my way to go, if you get the right pace to don’t jump among the hierarchy. The main point about this is that Clear for iOS is so beloved because using it feels natural, most of its gestures just flow as if you were using a notepad or from the regular trends of iOS. Simply put, it is easy to learn. In the mean time, as Clear for Mac attempts to bring the same efficiency it holds on the portable using most of the same recipe, it doesn’t apply naturally because the operational system is different and requires a different experience. Clear for Mac feels out of place. But, hey, it seems like I’m bashing much harder than it is supposed to, Clear for Mac is a great application, due to the circumstances, it is obvious that the Realmac team did an outstanding job moving to OS X and I give them credit because this article is not about bashing Clear for Mac, but to point out how challenging it is to translate the experience to another platform, even if they’re related. I don’t know if the team behind Clear thought they would be doing an OS X variant when they began sketching, but I bet that when they sit to think on Clear for Mac, they realized that Clear for iOS was so focused on the mobile guidelines that they moved into a trap, one which they graciously escaped from. Previous Looks like Java, not Cocoa.